Before I proceed to my Sunday analysis, I wanted to walk you through my past few analyses. 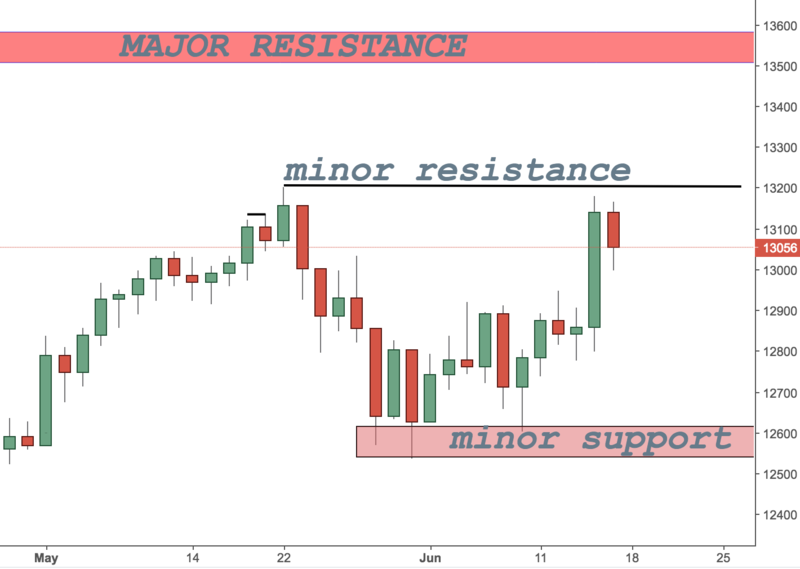 In my previous GBPUSD article, I was sharing with you that even though the daily setup looked like a pinbar, I would not have taken it because it was in the middle of a trading range and the general trend was bearish. I did not also consider shorting this pair, because of the close proximity of the support level at 1.3250. Price has now touched this level and I am still avoiding doing anything with this pair. It might take some time before we have a confirming indication from GBPUSD. In the article preceding the GBPUSD article, I wrote about Germany 30 (DAX). There was an inside bar on the daily chart but I missed the first potential trade (as indicated), because the SL was too large. I then waited for another price action confirmation and it came just a couple of days later. The first trade I took was based on a 4H pinbar. There were a number of other potential trades that came along in the next few sessions, some of which I managed to take as well. Today, I am looking at DAX again. The instrument printed an inside bar just below a minor support as indicated on the major screenshot above. I am still bullish, even though this is giving us negative connotations. I am looking for a potential retracement towards the 12975 area. If there is another bullish confirmation or bearish rejection candle, I might take another long trade. If, on the other side, I see price retracing lower than this level, I might reconsider closing my open trades. Ideal scenario would be if there is a pinbar that forms on the daily timeframe. Then, the inside bar from Friday would be rejected and this would give more way for the bulls to come in. Excellent trading MR Colibri !